This section contains information regarding journal articles, book chapters and presentations written or presented by MCSC staff. Barrott, J., Sunderland, A., Nicklin, J. & McKenzie Smith, M., 2013. Designing effective simulation activities. In: K. Forrest, J. McKimm & S. Edgar, eds. Essential Simulation in Clinical Education. s.l. :Wiley-Blackwell, pp. 186-195. Brennan, K. A., Jankowski, J., Hoyle, J. & Hormis, A., 2011. Neuro SIM: simulation-based induction programme. Anaesthesia, pp. 634-635. Freeth, D. et al., 2006. MOSES: Multidisciplinary Obstetric Simulated Emergency Scenarios. Journal of Interprofessional Care, 20(5), pp. 552-554. Freeth, D. et al., 2009. MOSES: Promoting patient safety in obstetrics with team-work focussed interprofessional simulations. Journal of Continuing education in the Health professions, pp. 98-104. Lewis, R., Strachan, A. & McKenzieSmith, M., 2012. Is High Fidelity Simulation the most effective method for the development of Non-technical skills in Nursing?. The Open Nursing Journal, Volume 6, pp. 82-89. McKenzie Smith, M. & Turkhud, K., 2013. Simulation-based education in support of HCA development. British Journal of Healthcare Assistants , pp. 328-333. Strachan, A. N., Graham, A. C., Hormis, A. P. & Hilton, G., 2011. What were the perceptions of primary care teams on learning from a single multidisciplinary simulation-based training intervention.. Education for Primary Care, 22(4), pp. 229-234. Lewis R, Kelly S, Whitfield M, McKenzie-Smith M, Strachan A. An evaluation of a simulation-based educational programme to equip HCAs with the necessary non-technical skills to undertake their role safely and effectively, specifically in relation to the measurement of vital signs. Barrott J, Graham A, McKenzie Smith M, Strachan A. Quality Framework. For use by Simulation and Clinical Skills Training Providers. In: Chappell M. Quality Management of Clinical Skills and Simulation Training. Poster Presentation: Michelle McKenzie Smith presented 'Using Human Factors training to reduce complaints and improve patient safety'. Presentation: Michelle McKenzie Smith presented 'Working together to Recognise and Manage the Seriously Ill'. Presentation: Sue Claypole presented "The Introduction of the Clinical Skills and Simulation Facilitator Role at Doncaster and Bassetlaw NHS Foundation Trust". This provided an insight into how 3 service areas, Resuscitation, Clinical Skills and Simulation, have combined in order to provide a more comprehensive training service. Presentation: Michelle McKenzie Smith presented ‘Adapting Simulation-Based Education to meet the learning needs of mental health nurses in Enhancing Patient Care in the Psychiatric Setting’ Michelle shared her journey of developing and delivering a course that aimed to meet the learning needs of Mental Health staff recognising and managing physical health problems on mental health settings as part of the regional RAMPPS programme. Presentation: Kelly Turkhud presented final results of TERRI research. Consultation: Paul Bedford - Assisted with investigation of Serious Incident from the human factors perspective. Workshop: Kate McNeil (Educational Lead Practitioner) facilitated ‘We all need TLC’, a workshop that aimed to illustrate the impact that Teamwork, Leadership and Communication can have on a situation. Presentation: Dr Paul Bedford (Consultant Anaesthetist) and Kelly Turkhud (Clinical Educator) presented ‘With the aid of simulation do the Multidisciplinary Theatre Teams feel confident and competent in managing theatre emergency situations?’ on behalf of Sharon Lukins (Educational Lead Practitioner) and Dr Anil Hormis (Consultant Anaesthetist). Poster presentation. With the aid of simulation do the Multidisciplinary Theatre Teams feel confident and competent in managing theatre emergency situations? Sharon Lukins. Workshop: Teaching Human Factors by Dr Paul Bedford. Presentation: Kelly Turkhud presented the TERRI course as a regional educational tool, available to all staff within the NHS working in the Yorkshire and Humber region. Presentation: Michelle McKenzie Smith ‘Adapting simulation based education to help all AHP’s involved in managing eating disorders’. Presentation: Kelly Turkhud ‘Bridging the practice theory gap in managing patients with tracheostomies’. Presentation: Michelle McKenzie Smith presented ‘Adapting Simulation-Based Education to meet the learning needs of mental health nurses managing eating disorders’ in the lecture theatre to an audience of nurses and other allied health care professionals. Michelle shared her journey of developing and delivering a course that aimed to meet the learning needs of Mental Health and Learning Disability staff in managing eating disorders. Presentation: Kelly Turkhud presented the TERRI course, disseminating amongst the network how simulation-based education can educate individuals in both the day-to-day and crisis management of patients with tracheostomies or laryngectomies, regardless of experience. Presentation: Michelle McKenzie Smith - ‘HCAs are VIPs’. Presentation: Kelly Turkhud presented the Tracheostomy Emergency Respiratory Resuscitation Issues (TERRI) course and was awarded Best Oral Work in Progress Paper. Presentation: Kate McNeil, Educational Lead Practitioner ‘Simulation and Its Place within the Palliative Care Field’. Presentation: "TERRI’ (Tracheostomy, Emergency, Respiratory and Resuscitation Issues) by Kelly Turkhud. Presentation: Simulation in medicine – why bother? by Dr Strachan. Poster: A survey of change in practice following simulation-based training in community dental practices - Sharon Lukins. Exhibition: Michelle McKenzie Smith & Kelly Turkhud exhibited the MCSC. Presentation: Dr Karl Brennan - the Neuro-Anaesthesia Simulation Training Course developed by Dr Anil Hormis from the Montagu Clinical Simulation Centre. Presentation: HCA’s are VIP’s - Michelle McKenzie Smith & Kelly Turkhud. Presentation: Porter R, Strachan A. Clinical Skills and Simulation Provision for Foundation Trainee in the United Kingdom. Presentation: Simulation, the Yorkshire Plan - Dr Strachan. Presentation: Michelle McKenzie Smith (Senior Clinical Educator) - “The Role of Clinical Simulation in Promoting Patient Safety”. Presentation: Michelle McKenzie Smith (Senior Clinical Educator) - “The Use of Clinical Simulation in the Recognition and Management of the Seriously Ill”. Workshop: Michelle McKenzie Smith (Senior Clinical Educator) facilitated a workshop on Patient Safety Workstream, attended by a variety of 45 Health Care Professionals. Workshop: Michelle McKenzie Smith and Kelly Turkhud (Clinical Educators) co-facilitated with the Blood Transfusion Service, a training session using the ECS portable simulator to highlight the hazards associated with blood transfusion. Exhibition: Alasdair Strachan (Co-Director), Alastair Graham (Co-Director) and Michelle McKenzie Smith (Senior Clinical Educator) exhibited the MCSC. Presentation: Paul Bedford winning joint 1st prize for an oral presentation on the Cardiac Anaesthesia Simulation Training (CAST) course. 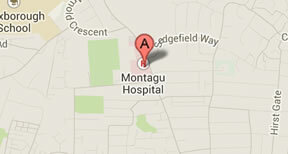 Presentation: Michelle McKenzie Smith - “Montagu Clinical Simulation Centre - An Overview”. CEMACH (Confidential Enquiry into Maternal and Child Health) Regional Conference on ‘Improving the Health of Mothers, Babies and Children’. Presentation: Michelle McKenzie Smith -“The Role of Clinical Simulation in the Promotion of Maternal and Child Health”. Demonstration: Michelle McKenzie Smith demonstrated the Centre’s METI simulation baby ‘Fran’. Presentation: Paul Bedford - Cardiac Anaesthesia Simulation Training (CAST) Course. Presentation: Anil Hormis - The Management of the Paediatric Potential Organ Donor (Paed POD). Workshop: Dr Strachan facilitated "Simulation can replicate General Anaesthesia experience for Caesarean Section". Workshop: Dr Strachan facilitated "UKFPO Sharing Good Practice – Opportunities for Clinical Skills and Simulation training in the Foundation Programme". Workshop: Michelle McKenzie Smith (Clinical Educator) – a workshop on Post Partum Haemorrhage, attended by 55 critical care nurses and midwives. Workshop: Michelle McKenzie Smith and Kelly Turkhud co-facilitated with the Blood Transfusion Service, a training session using the ECS portable simulator to highlight the hazards associated with blood transfusion. Exhibition: Sheenagh Hunt (Manager) and Kate McNeil (Educational Lead Practitioner) exhibited METI Baby (Fran). Exhibition: Kate McNeil and Sharon Lukins (Educational Lead Practitioners) exhibited the METI ECS (Emergency Care Simulator). Exhibition: Sharon Lukins (Educational Lead Practitioner) and Kelly Turkhud (Clinical Educator) exhibited the METI baby. Presentation: Survey in Change of Practice in Dental Practices following Simulation Training. Dr George Eapen. Abstract: Eapen G, Graham A, Strachan A. Survey of change in practice following Simulator based training in Dental Practice. Presentation: Evaluation of Paramedic Airway Assessment. Dr John McElwaine. Abstract: McElwaine JG, Strachan A, Barathi. Is simulation an acceptable method of re-accrediting paramedic airway skills? Presentation: The Innovation of Simulation in Critical Care Education. Kirsten Thomas and Michelle McKenzie Smith. Poster & Exhibition: Challenging Perspectives on Simulation & Skills in Health Care Education. Michelle McKenzie Smith. Exhibition: Dr Alasdair Strachan & Kate McNeil - exhibited the Emergency Care Simulator (ECS) portable manikin. Workshop: Acute Care Simulation Courses for Foundation Training. Facilitated by Dr Strachan. Presentation: Simulators in Medical Education. Dr Strachan. Presentation: What shall we do with our Simulation Centre? Dr Strachan. Abstract: Survey of Change of Practice following Simulator Multidisciplinary Training in Primary Care. Graham AC, Strachan AN. Poster: Berridge EJ, Freeth D, Sadler S, Graham A, Strachan A. Improving patient safety with simulation-based interprofessional teamwork training: evaluating ‘MOSES’. Presentation: Managing the potential Organ Donor Course. Dr A C Graham (winning 2nd prize for best oral presentation). Presentation: Survey of change in practice following simulator-based multidisciplinary training in primary care. Dr A C Graham, Dr A N Strachan, Dr K Russon. Poster: Graham AC, Strachan AN. Simulator Based Multidisciplinary Training in Primary Care. Poster: Graham AC, Strachan AN. Simulator Based Multidisciplinary Training for Theatre Teams Research connected to the Simulation Centre. Presentation: Setting Up and Running a High Fidelity Simulation Centre - Neil Pease. Poster: Simulator Based Multidisciplinary Training in Primary Care. Dr A C Graham, Dr A N Strachan, Dr M Coleman. Poster: Simulator Based Multidisciplinary Training for Theatre Teams. Dr A C Graham, Dr A N Strachan.